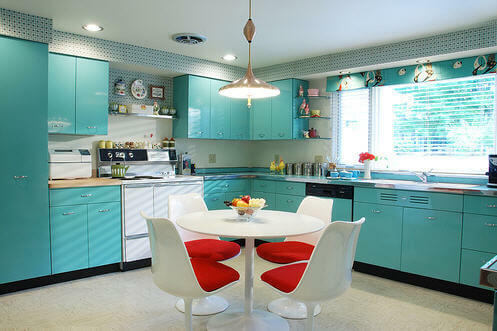 Speedway Ron is on the lookout for ideas for really terrific 60s kitchen designs, so we will be on the lookout, too. My goodness, these are chock full of ideas!!! Ad:Vintage Hotpoint. Click thru for 5 kitchens in all, along with a little primer…. 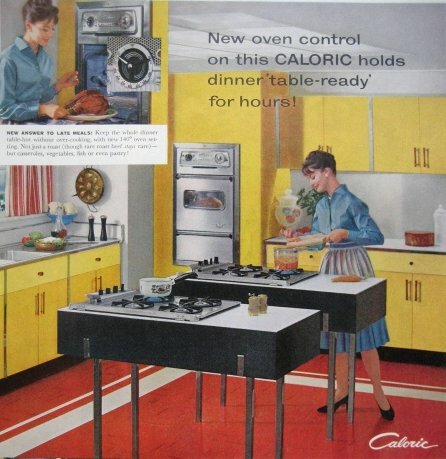 The 40s featured white kitchens with a lot of primarily red-white-blue accents. White – because it was sanitary, and this was also the first wave of fitted kitchens across America – so the design shock was already enough to handle. Red-white-blue because it was patriotic. 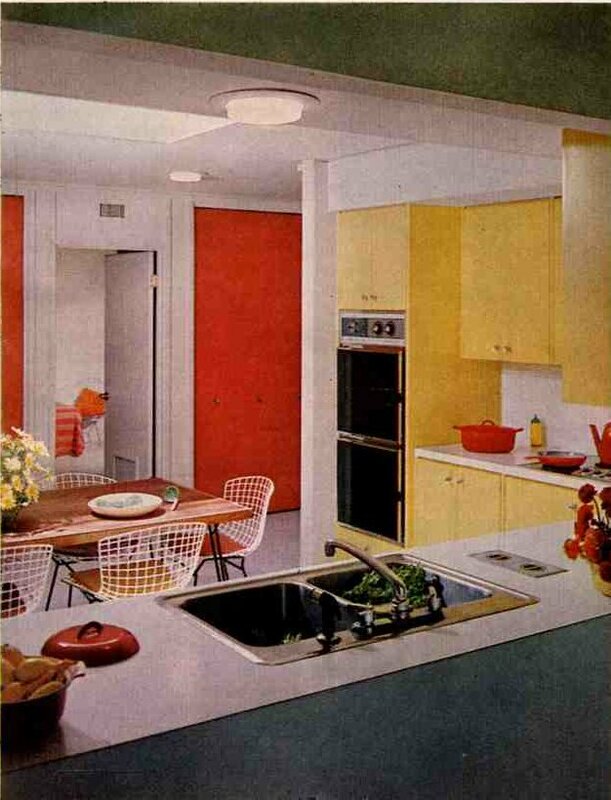 You saw other primary-color accents as well…Kitchens were sweet, cheerful. 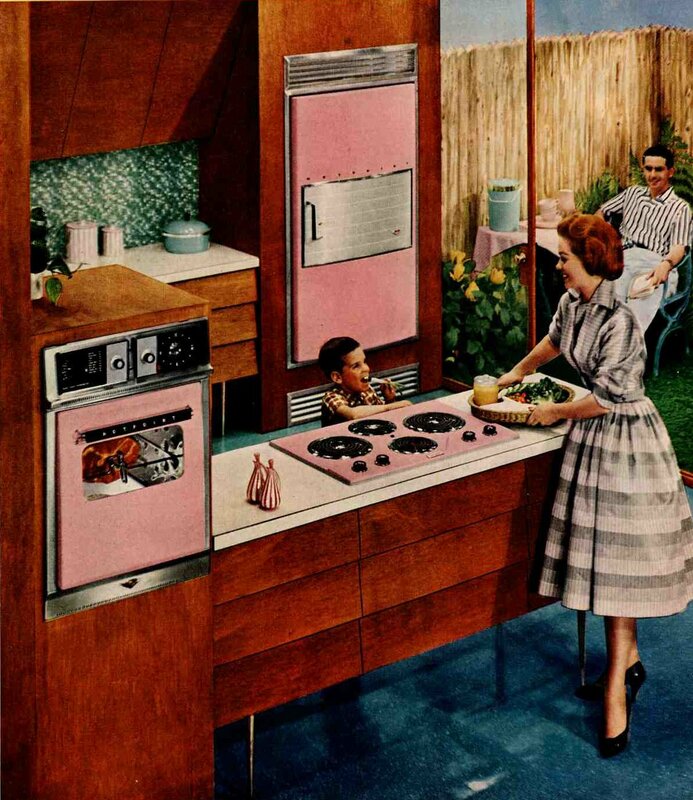 In the 50s, kitchens were chock-full of innovations: Appliances, dishwashers, new flooring and countertop styles… Color started out white early on…but by the mid-50s the pastel revolution had taken hold. 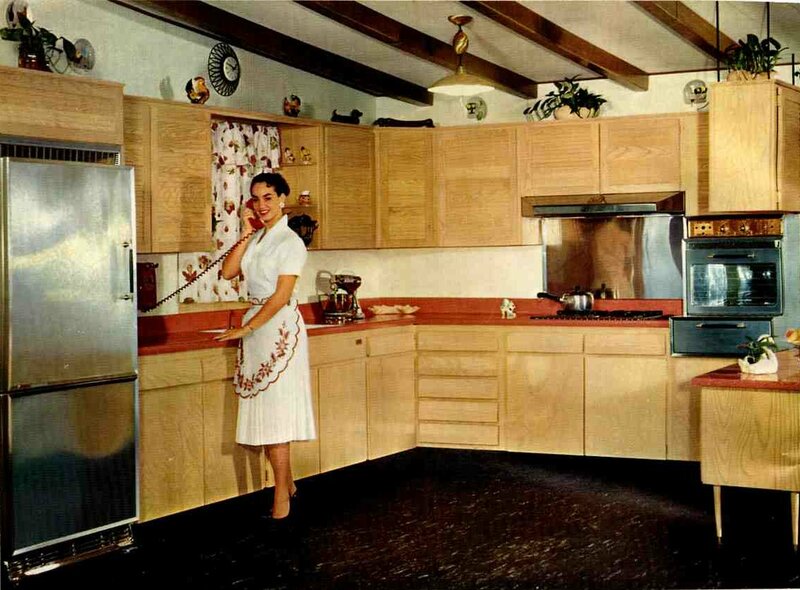 In addition, there were plenty of knotty pine kitchens, don’t forget. By the 60s, even more changes took hold. 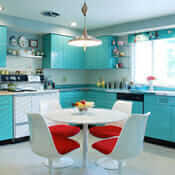 There was more open concept design in homes, and as a result, kitchen cabinets started to take on the look of furniture. Also, contemporary styles finally became more popular, so you saw cabinets lifted off the ground with danish modern-style legs. Again, though, don’t underestimate the popularity of simple wood cabinets – many families still preferred “traditional” styling and not to mention – wood was affordable. Back in these days, people were still thrilled — to have the basics. That wall mounted Hotpoint Fridge is awesome. I’ve never seen one before. I have a floor version of the same fridge. Now I need this one too! You’re killin me! 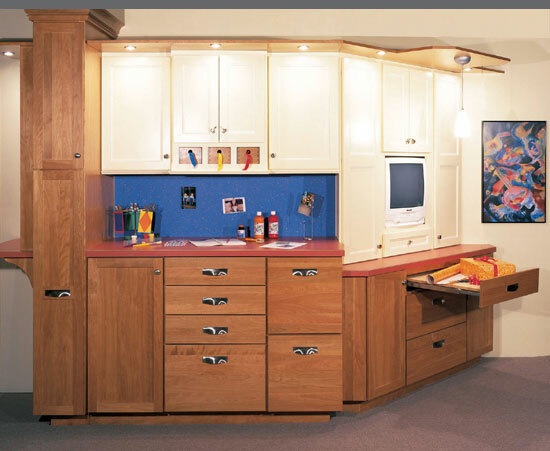 Something to remember about vintage kitchens is that modular cabinet systems like we have today from manufacturers such as Kraftmaid, IKEA, Merillat, etc. were still relatively uncommon. With the noted exception of St Charles in higher-end kitchens and metal kitchens, site-built custom cabinetry was the common standard. That was a wonderful history!